Have you ever struggled to pinpoint the target market for your freelance writing services? If so, I have a free tool that might help. I decided to overhaul my old target market worksheet, previously only available to those who purchased my Web Writer's Guide e-book which is no longer available. I'm releasing the updated version as a freebie. You'll be able to find it in my collection of resources for writers along with other downloadable worksheets and templates, online tools and calculators, free reports, and more. Here is a preview of the new target market market worksheet. You can find instructions on how to use it, and the download link, below. Mention a general classification of the type of client you want to work with. This could be small business owners, corporate clients, consumer magazines, trade publications, etc. This includes things like your target clients' age range, gender, location, education level, parental status, marital status, or similar descriptions as relevant. Note the specific industries or niches you most want to target. Remember to keep these similar if you choose more than one. This way your marketing can do double duty (or more) because you won't have to target several completely different markets. Now mention the specific types of writing projects these target clients seek out or might have a need for. Remember, someone can't be a member of your target market if they can't afford you. They would be in a lower-tier market, and that's one you don't want to waste time or resources pursuing. So make sure you have an idea of what these projects will cost on average, and note that in this section. In order to effectively market your services to any particular client group, you must understand their motivations and what influences them. In other words, what would they hope to get out of the typical project type you listed? Increase organic traffic through better search engine rankings and increase conversions from blog readers to email subscribers. Now note anything that makes you stand out among the competition, when considering the other factors you've listed. This might include extensive experience, unique skills, your educational background -- anything you can use in your marketing efforts to appeal to these particular clients. Put all of these things together, and you'll have a good picture of your target market. 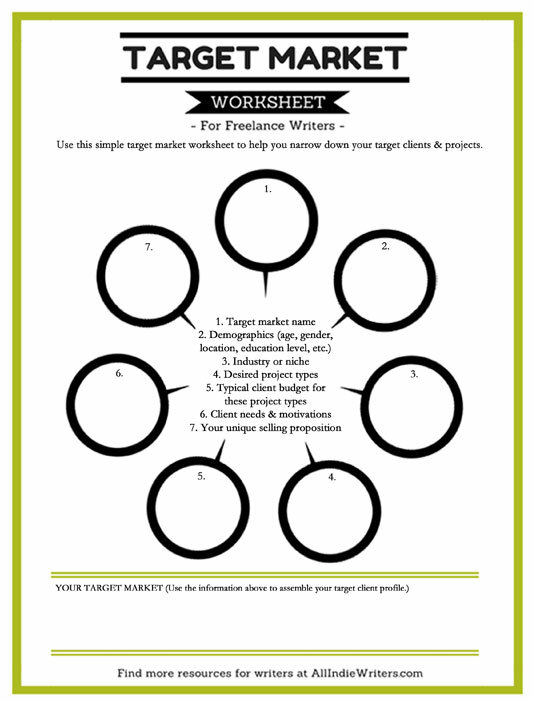 Need help mapping out the target market for your freelance writing business? Download your copy of this target market worksheet today. In fact, I think it could work for any small business owner. Many struggle to find their target market — I did! But your worksheet makes it easier. Once you define your target market, you can step back, review the worksheet, and make sure your target market is, well, on target. If not, revise it. Very true. This would work for pretty much any kind of business, but especially service-oriented ones. Sometimes breaking things down is all we need to figure out why a marketing strategy isn’t working — it might be designed for someone other than the market members you’re really trying to reach.